For six months of the year Shen Yun Symphony Orchestra accompanies Shen Yun dancers as they tour the world. Last fall the orchestra had its solo debut at Carnegie Hall in New York City. The orchestra brings together a full Western orchestra and complements it with the unique character of several Chinese instruments. “Perfect. Really professional,” Ms. Djinjova said of the vocalists. Originally from Bulgaria herself, Ms. Djinjova very much enjoyed the chance to see a fellow Bulgarian, conductor Milen Nachev. Nachev is one of four conductors who took the stage during the evening. Each with their own style highlighting further the versatility and talent of all the orchestra members. 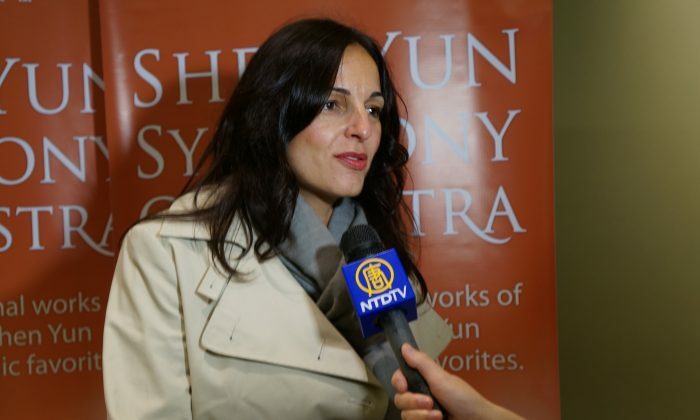 A San Diego couple visiting the Boston area also attended the Shen Yun Symphony performance. “We were thrilled with it! Just a real serendipity for us!” said retired school teacher Marty Stirtz. She said they really appreciated the opportunity to attend and learn about the performance. “I loved it, Every minute of it. I love especially the soloists, it moved me,” said Stirtz.